This modern and stylish water dispenser complements any workspace and has revolutionised the provision of drinking water for the workplace by offering both boiling and chilled water in the same unit. This innovative machine is proving to be extremely popular in work spaces of up to 10-15 staff and offers a host of features: a proven energy consumption reduction of 25%; Spil Guard leak protection and the Hygiene Guard silver impregnated dispense tap reduces bacteria transfer and cross contamination. 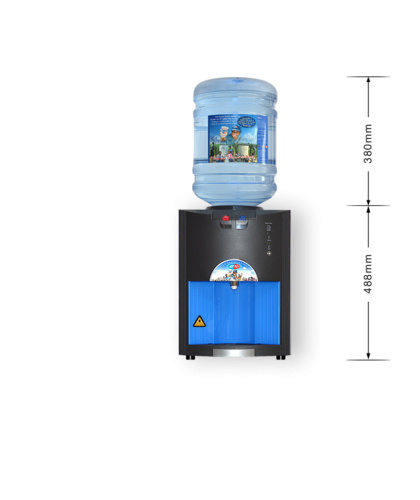 The Fusion Desktop water cooler is also available as a Bottle Fed Free Standing and Mains Fed water cooler. 18 ℓ per hour cold water supply. The Bottle Fed top includes Spil Guard leak protection. Available as Free Standing Bottle Fed and Mains Fed water dispenser. We aim to schedule both the installation of your water cooler or dispenser and any deliveries at your earliest convenience. We are generally able to deliver bottle-fed water dispensers and water coolers within 48 hours.